See the gallery for quotes by Rachael Ray. You can to use those 7 images of quotes as a desktop wallpapers. Whatever it is you want to do, take a job in that field. You will learn by experience and, slow and steady, you'll get it done! When men I have dated over the years whined about, 'Oh, you make no time for me' - see ya! I just dumped them. I don't need that pressure in my life. When you're out grocery shopping for your family, maybe you can put a can of cat or dog food in your cart and bring it to an animal relief center. You don't feel as self-conscious if your clothes fit. You know, food is such - it's a hug for people. Good food and a warm kitchen are what makes a house a home. I always tried to make my home like my mother's, because Mom was magnificent at stretching a buck when it came to decorating and food. Like a true Italian, she valued beautification in every area of her life, and I try to do the same. I do 280 episodes of TV a year, write 15 recipes for the magazine, and publish an annual book. With all of that, we try to get one weekend a month with Isaboo at our home in the Adirondacks to relax and recharge. I had the lunchbox that cleared the cafeteria. I was very unpopular in the early grades. Because I hung out with my grandfather, I started to bring my lunchbox with sardine sandwiches and calamari that I would eat off my fingers like rings. I was also always reeking of garlic. I have learned how to breathe, to use my cords differently. I had been tilting my head in a way when I talked that wasn't good for my throat. I've been working on all of that, and it seems to be helping. I have this extraordinary life during the day, and then I get to come home to my sweet husband who loves to cook with me. I have a nice glass of wine, he has some scotch, we chat, we cook, and we hang out with the dog. I have an absolute dream life. I live in, literally, the same home when I was swiping my first bank card and wondering if I'd have to put back the Charmin. We still don't have a dishwasher. My mom has done all these gardens so now my house looks like the garden shack in the middle of Versailles. I started running 3 miles every morning after throat surgery to remove a cyst last year. The gym used to be my adversary. But that has all changed. Now, I look forward to it every morning. I wish I could be as thin as Jessica Simpson. I think she looks gorgeous! I have had Jessica on my show several times, and I can tell you that girl is genuine and funny with a great self-deprecating sense of humor. I work too much to be an appropriate parent. I feel like a bad mom to my dog some days because I'm just not here enough. I just feel like I would do a bad job if I took the time to literally give birth to a kid right now and try and juggle everything I'm doing. I write in freehand equivalents because measuring, to me, takes away from the creative process of cooking. Two turns of the pan with EVOO is about two tablespoons. I'm an all-things-in-moderation kind of person. I do eat a warm donut occasionally. I especially enjoy a cider donut when I'm apple picking. I don't think there's anything wrong with that. I'm not a chef. I haven't created any new technique in the kitchen. I'm not a rocket scientist. I think I'm good at writing accessible, fun, and affordable meals for the average American family. That's what I think I'm good at. My husband cooks fancier food for himself than I've ever cooked on-air. I call him from the road, and he's making champagne-vanilla salmon or black-cherry pork chop. Half of me is feeling unworthy. Not only am I not a chef, I'm not a better cook than my own husband! My mom, who's been in the restaurant business for 40 years, is the number-one influence in my life. But I look up to a lot of people in the industry. Tops on my list is Mario Batali. My mom and Mario taught me the same lesson: Food is love. Television itself is an intimate medium. It's in your house. You're visiting with these people... Not everybody's going to like it, just like not everybody likes everybody on the playground. I mean, that's life - especially if your job is to just go out there and be yourself. The magazine, the daytime show, we've always tried to write affordable, accessible. Those are key words for us, and I do mean us, a huge staff of people at the magazine who love to cook affordable, friendly food that helps families eat better for less. 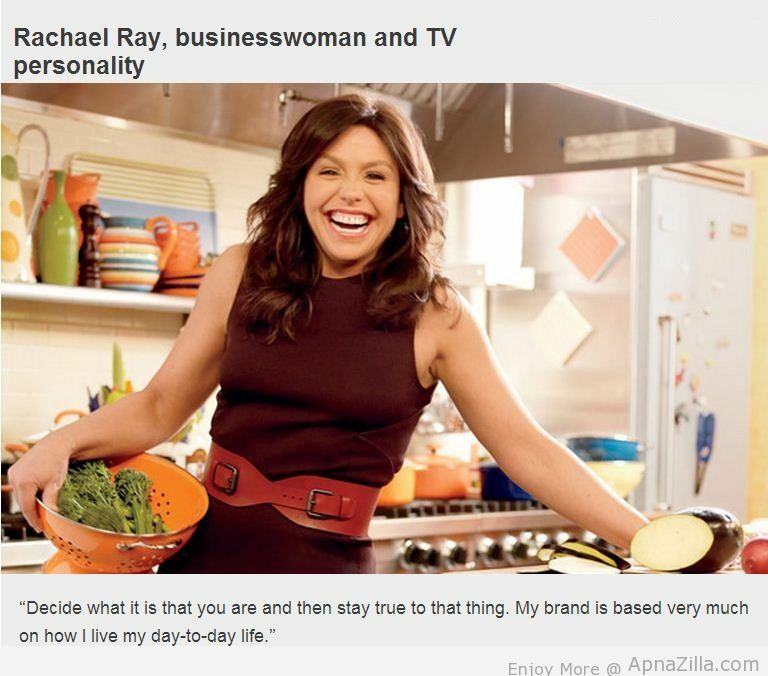 Much more quotes by Rachael Ray below the page. When I do a 30-minute meal, for instance, on Food Network, that's my food you see at the end of the show and it's not perfect. And if sometimes things break or drop or the pasta hits the wall when I'm draining it, they never stop tape. They just kind of let me go with it. My dream job is to be a rock drummer and the alternate drummer for the Foo Fighters. Work hard. Laugh when you feel like crying. Keep an open mind, open eyes and an open spirit. It's continuously humbling to work hard, you know? As long as you've got a good work ethic and a sense of humor, I don't think anybody can become too much of an egoist under those circumstances. I tried to bake a cake for my mother's birthday - it took me four hours. It was terrible, and I cried for three days. I have a fat head - I get freaked-out looking at pictures of me. I like feeling like an ox at the end of the day. I like working hard. We created a line of pet food called Nutrish that's made to human standards, and 100 percent of the proceeds go to animal rescue. One of our top-tier donors is the ASPCA, and they help us challenge animal shelters all across the country to get more animals placed in homes. We have a queen-size bed and the dog sleeps in the middle. John and I are sort of these little quotation marks on either corner. If you want to look at the state of humans, you should look at the state of animals first. People are choosing whether or not they can feed an animal and their family. And every shelter coast-to-coast is stuffed. Never be a food snob. Learn from everyone you meet - the fish guy at your market, the lady at the local diner, farmers, cheese makers. Ask questions, try everything and eat up! EVOO is extra-virgin olive oil. I first coined 'EVOO' on my cooking show because saying 'extra virgin olive oil' over and over was wordy, and I'm an impatient girl - that's why I make 30-minute meals! NASA asked me to create meals for the space shuttle. Thai chicken was the favorite. I flew in a fake space shuttle, but I have no desire to go into space after seeing the toilet. I do know what my first meal in the next world would be... Spaghetti Aglio e Olio, heavy on everything. I don't categorize food as bad or a guilty pleasure. I don't think young men or women should feel pressured into marriage. You shouldn't marry anyone, in my opinion, who you have to try hard for. I felt I'd earned the Good Housekeeping Seal when I designed an oval-shaped spaghetti pot, because spaghetti is long. I make a dog-friendly version of almost everything that we make for dinner. I measure in my palm and use my eyes to estimate amounts; a tablespoon is a full palm of dried spices. I used to say I would never run unless I was being chased by someone with a gun. Now I'm a little obsessed with it! It only looks like I get to eat a lot of food on TV. I really just get the one bite and the crew and guests eat everything else. Make big pots of soups, stews and chilis - they stretch a buck, and you can live off them for days! My first memory in life is grilling my thumb to the griddle in our restaurant on Cape Cod. Since I never get on a scale, I have no idea how much weight I've lost!